Is SoftBank Shaping Up to Be a Big Autonomous Driving Winner? 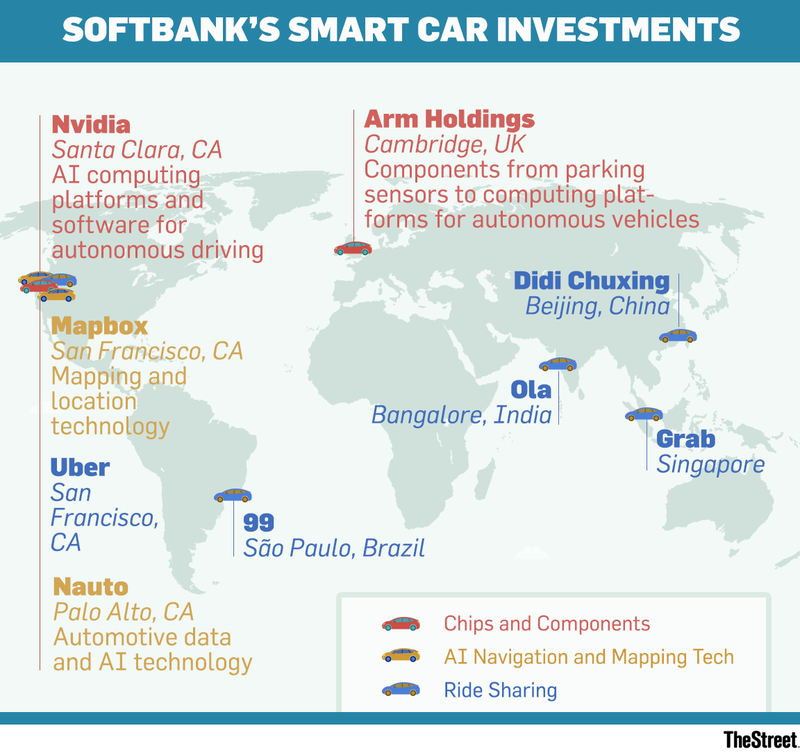 SoftBank's investments range from Nvidia to Uber to GM Cruise and include many more. Is it set to become an autonomous driving winner? Softbank all in on autonomous. Autonomous driving is all the rage. Consumers are hearing and talking about it, investors are jumping into stocks that are exposed to it and enthusiasts are salivating at the routine breakthroughs the industry continues to make. And why shouldn't they? It's an exciting area of technology that's improving at a exponential rate that will make our lives more convenient and safer. There's plenty of reason to be excited about the technology. Finding a stock that can take advantage of the autonomous driving trend is pretty broad as well. There's tech companies like Intel Corporation (INTC - Get Report) and Nvidia Corporation (NVDA - Get Report) , the latter of which we've called a big winner in this trend before. There's automakers like Ford Motor Co. (F - Get Report) and General Motors Co. (GM - Get Report) , as well as the emergence of Alphabet's (GOOG - Get Report) (GOOGL - Get Report) Waymo teaming with Fiat Chrysler Automobiles (FCAU - Get Report) . Apple Inc. (AAPL - Get Report) is rumored to be on the sidelines and there are countless suppliers, chipmakers and sensor manufacturers that will benefit from the trend. But one of the biggest winners in the fund be ... SoftBank Corp. (SFTBY . Think about it. Between it and its Vision Fund, the company owns almost 27 million shares of Nvidia, good for a more than $7 billion stake. SoftBank also has billions invested (almost $10 billion in Uber alone) into multiple ride-hailing services across the globe. These companies are working on autonomous driving features as well and many believe they will be huge beneficiaries when the technology begins to launch because they can remove their largest expense, the driver. Nvidia, Apple and Alphabet are holdings in Jim Cramer's Action Alerts PLUS member club. Want to be alerted before Jim Cramer buys or sells these stocks? Learn more now. SoftBank acquired Arm Holdings for a whopping $31 billion back in March 2017. The chipmaker has its hands in all sorts of automotive sensors, safety features and automotive and autonomous products. Then there's SoftBank's $2.25 billion investment in GM's Cruise unit, the latter of which SoftBank now has a near-20% stake in and focuses on autonomous driving. "Smaller" investments -- some for $100 million, others for $500 million and everything in between -- are sprinkled in there, too. All of these smaller investments create synergies among SoftBank's portfolio. That's really what it's all about, too. By owning a company like Arm Holdings and having large investments in others, maybe SoftBank needs some cybersecurity services for its vehicles. Perhaps it can get those services from another company it's invested in, Cybereason. Maybe it needs some virtual simulations done for a smart city layout, which it can get from Improbable, another one of its investments. It's hands are literally everywhere and the overlap is impressive. In a way, it's almost as if no matter who wins, SoftBank will be a winner because it's got so many different pieces of the pie. Given that it's massive investment in Uber was just a few months ago and SoftBank's big investment in GM Cruise is relatively fresh, I wouldn't be surprised if more deals from SoftBank continue to flow.